This program was recorded on Tuesday, July 15, 2008, at the Clarion Hotel and Conference Center in Cherry Hill, NJ. 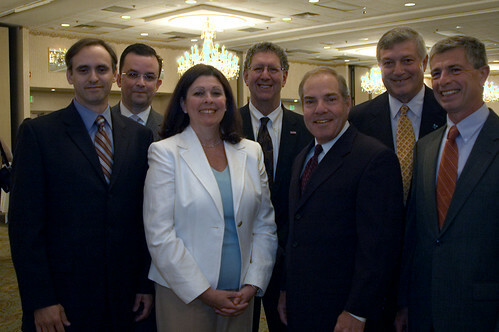 Cherry Hill, New Jersey, USA – Tuesday July 15, 2008: Panelists were (from left): Jay Jones, deputy executive director, sSouth Jersey Port Corporation; Lance de la Rosa, regional general manager, Wal-Mart Stores; Deb DiLorenzo, president, Chamber of Commerce of Southern New Jersey; Dean Mitchell Koza, moderator; Stephen Greenberg, shareholder in FlasterGreenberg, sponsor of the program; Anthony "Skip" Cimino, president and chief executive officer, CMX Engineering; and Herb Taylor, Ph.D., vice president and corporate secretary of the Federal Reserve Bank of Philadelphia. About 350 people attended the program.